The Goal Is Simple: To Promote & Cultivate Climbing in Wyoming. 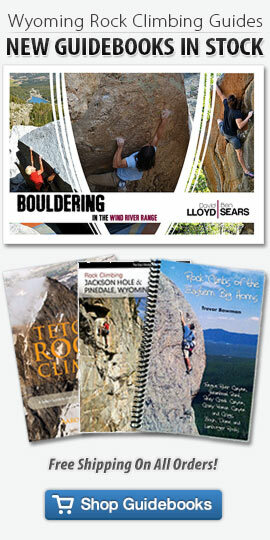 ClimbingWyoming.com started out as the sister website to the Jackson Hole, Wyoming region guidebook. Yet the website has grown over the years and hopefully someday, will mature into something much more. Wesley Gooch enjoying the views from the summit of Sundance Pinnacle near the Cirque of the Towers. Photo by Jed Conklin. This site is not supposed to be a replacement for the MountainProject.com, RockClimbing.com, or other online climbing communities. So why not post guidebook supplement information on the aforementioned websites? The quality of content, accuracy, presentation, and depth of supplement information would not be as controllable when freely open online. Wesley Gooch is the primary author of this website’s content but hopefully more passionate climbers will help out in the future. If you would like to contribute content or provide feedback please inquire on the contact page. If these peaks could speak, such as I believe they can, I fancy thunder would be their voices.